Today is a day for inspiration! I’m happy to share some really uplifting and heart-opening information with you about great things happening in the world of gardening and fresh produce. In the resort town of Jackson, Wyoming two visionary women are creating not only a wonderful opportunity for the town but also a very large amount of organic produce. Veggies are a personal favorite of mine, as you know! This exciting project began eight years ago when Penny McBride and Nona Yehia met at a party. Over time, the business Vertical Harvest was co-created. Vertical Harvest uses hydroponic farming methods to grow various veggies in the harsh Wyoming winters, and all year round. The greenhouse itself is a three-story structure that has been constructed on a 4,500 square-foot downtown lot. Central to this greenhouse’s ability to produce a bounty of veggies is their use of the relatively new practice called vertical farming. Construction presented some unforeseen issues, as always seems to happen when new designs are introduced. Overall, after much discussion with the town council and governmental agencies, it’s so wonderful to know that by early May greens will be growing and soon thereafter, the bountiful harvest will be sold to local grocery stores, restaurants and also in a retail shop. The perfect additional piece to this story is that the customized employment model chosen allows for 15 people with disabilities to work and be truly productive. What a worthwhile endeavor! Of course, hydroponic growing is nothing new to Walt Disney World in Orlando, Florida. It’s astounding to tour the Land Pavilion there and see firsthand the gardens they’ve created and the food they constantly produce. Besides providing vegetables for the restaurants on site, there is ongoing research into vegetable species and growing practices and also wonderful opportunities available for those passionate about growing to intern in this fascinating place. I clearly understand the value and joy of hydroponic gardening. I’ve been involved with two different systems myself for a number of years now. 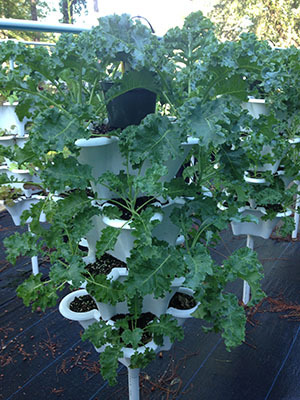 Our biggest producer is this stackable vertical system, which uses coconut coir (instead of dirt) to stabilize the root system. The nutrient solution is provided to the plants a few times daily through a timer system. Next weekend we’re moving it to Vital Planet Company Headquarters so everyone here can enjoy the grow experience, and the yummy veggies. We’ll just walk outside and pick our salad for lunch! We also have a Tower Garden. It’s a different type of system that allows the roots of the various plants to hang in midair. The roots are misted regularly throughout the day and night. This particular system was invented by a gentleman who had previously managed the hydroponic gardens at Disney. The plants are so vibrant and the root system so interesting that we’ve even used them as centerpieces at big events in the past. Hydroponic growing insures that the plants are getting the nutrition they need to provide optimal vibrancy, and secondarily, the best nutrition for us. The phrase “Beyond Organic” has been used. That’s really a blessing for us, considering the soil here in Florida is mostly sand. And I must say, our hydroponic veggies are extremely delicious and beautiful! Recently I came across a different type of tower system, which I’m sure at some point in the future we’ll try too. To me, the most appealing aspect of this grow system is sustainability. It seems to require little maintenance and makes use of worms and your kitchen scraps to create compost and self-fertilize. And no electricity is required! So if you find any of this information interesting, I encourage you to go for it! It’s a truly wonderful experience for the family to walk outside and gather dinner from your own patio or backyard – even right in the city!